Global Exchange has been a nationally recognized leader of the Fair Trade movement in the United States for years. We support Fair Trade because it revolutionizes the global economy by setting minimum standards for the economic, social, and environmental performance of companies. In today’s world economy, where profits rule and small-scale producers are left out of the bargaining process, farmers, craft producers, and other workers are often left without resources or hope for their future. Fair Trade helps exploited producers escape from this cycle and gives them a way to maintain their traditional lifestyles with dignity. Fair Trade products are a stark contrast to those produced under principles of unbridled free trade, in a global market economy plagued by sweatshops, human rights violations and environmental degradation. Over the years, Global Exchange has focused on the following Fair Trade campaigns: Coffee; Chocolate; Sweatfree; Fair Trade Stores; Where to Buy Fair Trade. The United States consumes one-fifth of all the world’s coffee, making it the largest consumer in the world. But few Americans realize that agriculture workers in the coffee industry often toil in what can be described as “sweatshops in the fields.” Many small coffee farmers receive prices for their coffee that are less than the costs of production, forcing them into a cycle of poverty and debt. Starbucks Campaign: In 2000, a campaign by thousands of activists across the country pressured Starbucks to carry Fair Trade coffee in all their cafes. As a result, on October 4 Starbucks introduced whole bean Fair Trade Certified coffee at over 2,300 stores, which brought the number of Fair Trade outlets to almost 5,000 nationwide (it’s currently over 7,500). This is an amazing testament to the power of grassroots Fair Trade activism and the real concrete changes that citizens can make in the global trade system when we demand products made under fair labor conditions. Procter & Gamble the Largest US Coffee Company to Pay Farmers a Fair Price: Impoverished coffee farmers around the world won a victory when Procter & Gamble, the largest seller of coffee in the United States, announced on September 15, 2003 that it would begin offering Fair Trade Certified coffee though its specialty coffee division, Millstone. Procter & Gamble’s agreement to sell Fair Trade coffee came in response to a grassroots campaign by Global Exchange, Oxfam America, Co-op America, the Interfaith Fair Trade Initiative, and socially responsible shareholders calling on the corporation to assist the millions of coffee farmers hammered by the collapse of coffee prices. Victories in both campaigns helped catalyze an explosion in consumer awareness of and demand for Fair Trade products, and triggered a domino effect in the coffee industry that brought Fair Trade to cafes and store shelves nationwide. After these victories, we turned our focus to Fair Trade chocolate. The lack of fair prices for cocoa has left farmers in severe poverty, and has led to the common practice of forced child labor as a means to reduce the price of production. Over a quarter of a million children work in West African cocoa fields under slave-like conditions. This abysmal reality has been documented by numerous sources—the International Labour Organization (ILO), US Department of State, and Save the Children. The Solution –Fair Trade: The Fair Trade system offers a proven solution to ending the cycle of poverty and child labor abuse on cocoa farms. Fair Trade guarantees participating farmers a “floor” price per pound, which has allowed thousands of Fair Trade certified farmers the opportunity to provide for the real needs of their families and communities. Fair Trade also protects children and the environment, as Certified farmers are prohibited from using child labor and are required to use environmentally sustainable production methods. Global Exchange’s Fair Trade Chocolate campaign worked to transform the chocolate industry to a Fair Trade system. When it comes to the corporate bottom line for chocolate companies, kids have more power than they realize. Children are the major marketing targets of candy and chocolate companies, which will rise or fall on kids’ purchasing preferences. Global Exchange’s Fair Trade Reverse Trick-or-Treating (RTT) Program has proven to be one of the Fair Trade movement’s most effective tools for educating the public about Fair Trade, for building the capacity of children to be activists for economic justice, and for pressuring the chocolate industry by garnering large amounts of national and local press. Global Exchange and our RTT allies engaged over 10,000 children and families, who on Halloween night go door-to-door and give their friends and neighbors Fair Trade chocolate attached to an information card about the importance of Fair Trade, instead of or in addition to taking candy during their Halloween rounds. As a result, roughly a quarter-of-a-million households receive information about Fair Trade. It has proven to be an effective and fun way to spread the word about the importance of Fair Trade. The Raise the Bar Hershey campaign, led by Global Exchange, Green America and International Labor Rights Forum, and joined by over 150,000 consumers, union allies, religious groups, and over 40 food co-ops and natural grocers pressured Hershey to address child labor for several years. In 2012, Hershey Co. announced that it will be certifying 100 percent of its cocoa by 2020, with incremental benchmarks to be monitored by the campaign. It’s a milestone victory for the Fair Trade chocolate movement, and most importantly for farmers and the children who have been forced to work in West Africa’s cocoa fields. Ghirardelli – Put a Fair Trade Label on It! After the victory against Hershey’s, Global Exchange launched a campaign challenging local San Francisco chocolate icon Ghirardelli to follow suit. Ghirardelli Chocolate claims to make premium chocolate by carefully selecting cocoa beans of the highest quality, but real quality should not come at the cost of environmental destruction, poverty, and bitter child labor. We called on the company to certify its chocolate as Fair Trade. While the public pressure we generated got us several sit-down meetings with Ghirardelli and their parent company Lindt, Ghirardelli has yet to go Fair Trade. We are still waiting for them to take the steps that will really ensure their supply chain is fair! Global Exchange opened Fair Trade stores on both coasts to promote Fair Trade and expand markets for cooperatives and other producers around the world. The Global Exchange Fair Trade Stores set an example of working responsibly with world craft producers. We generated income for thousands of artisans and their families in over 40 countries, by operating according to Fair trade Criteria. Global Exchange Fair Trade Stores featured products from around the world, with fair prices for consumers and fair prices paid to producers. After 25 years in business, Global Exchange closed the doors of its last Fair Trade Store in 2015. A decade ago, most people only knew about sweatshops through what they had read in history books. The resurgence of the sweatshop can be directly linked to the expansion of corporate globalization. The sweatshop is both metaphor for and proof of the lawlessness and inequities of the new global economy. Every new sweatshop exposé raises new doubts about who corporate globalization is really benefiting. Global Exchange has long been a leader in this fight, from exposing sweatshops and winning compensation for workers in Saipan, to taking on Nike, to organizing to make our cities Sweatfree [jump down link] to challenging free trade agreements that create the “race to the bottom” economic model that puts workers at risk. In 1999, Global Exchange exposed the indentured servitude of nearly 50,000 Asian women migrants in the US Commonwealth of Saipan. Our campaign forced nearly two dozen U.S. garment retailers to put an end to the practice and agree to independent monitoring of the island’s garment manufacturing industry. The anti-sweatshop movement scored a major victory in September 2002 when 26 major retailers settled a lawsuit targeting working conditions on the island of Saipan. The settlement capped a bitter, three-year legal struggle between advocates for sweatshop workers and some of the world’s largest apparel companies. In 1999, Global Exchange, Sweatshop Watch, the Asian Law Caucus, and the garment workers’ union UNITE filed a class action lawsuit on behalf of workers in the Commonwealth of Saipan. Consumer pressure, spearheaded by Global Exchange and Sweatshop Watch, helped convince 19 retailers to settle the lawsuit in 1999 and 2000. But several of the corporations— led by Gap Inc., JC Penney, and Target—refused to settle the suit, preventing a comprehensive resolution to workers’ woes. That resistance finally broke down, paving the way for a full settlement involving the US retailers and 23 local manufacturers, who together will pay $20 million into a fund to pay for back wages and create an independent monitoring system to prevent future abuses. In the late 1990’s Global Exchange took on Nike – challenging one of the largest, most popular, and most profitable shoe and clothing companies in the world, to address the problem of sweatshops in their supply chain. In just a few years, public pressure reaped a measure of success by forcing Nike and other shoe corporations to promise to make changes. Still, a great many improvements are needed and the anti-sweatshop movement still must strive to give workers a voice. 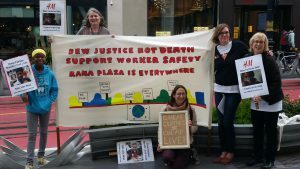 In April 2013 the Rana Plaza building in Bangladesh collapsed, killing 1130 and injuring approximately 2500 garment workers and children in the daycare facilities in the building. Global Exchange joined the International Campaign for Labor Rights and other allies in campaigning actively for apparel companies to sign onto the legally-binding Accord on Fire and Building Safety in Bangladesh, a joint agreement with unions to ensure urgently needed factory renovations to help prevent future disasters and save garment workers’ lives. We also called on multinational apparel brands and retailers to pay full and fair compensation to the injured workers and families of the deceased. Following a series of demonstrations, the victims finally received their full compensation in mid-2015. Since then, the ILRF, the Clean Clothes Campaign, United Students Against Sweatshops, and other allies have been monitoring how well the 200+ apparel companies that have signed onto the Accord are upholding their commitments. Global Exchange, in partnership with SweatFree Communities, helped spark and build a national movement to address a root cause of worker exploitation and economic injustice by encouraging local communities to become “sweatfree.” Our Sweatfree Cities Campaign educated, mobilized, and empowered U.S. citizens to use their collective citizen consumer power to pass local policies that ensure their tax dollars are not used to support sweatshop labor and conditions. Local and state governments spend approximately $400 billion a year on goods and services. Therefore, passing local government sweatfree purchasing standards has the power to create substantial demand for products made in fair and just conditions. The San Francisco Sweatfree Procurement Ordinance was unanimously passed by the Board of Supervisors on September 6, 2005. The ordinance prohibits the city government from purchasing goods made in sweatshops. This was a significant victory for the Sweatfree Cities movement.